It’s a really interesting, fun and thought-provoking read. 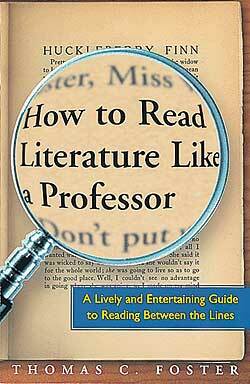 This entry was posted in books and tagged literature, nonfiction, Thomas C. Foster. Bookmark the permalink. I’ve heard of that book. It sounds intense. I hope you enjoy it! I thought it was captivating. A really strong script by Linda Woolverton, a great twist on the story, and a gorgeous look. And I’m a really persnickety movie goer 😉 . Oh that makes me more excited to see it! Please do, and tell me what you think! I’ll try! I rarely see movies in the theatre. That makes two of us 🙂 . Looks interesting! I’ve been nursing a cold over the weekend, so read a Dan Brown novel I bought at CVS with my cold meds 🙂 for work I’m reading a book about student loan policies. Thank goodness CVS has books! Are you enjoying your work read?